I am now the proud owner of a 2017 ocean blue sport se. I would like to change the two headlight bulbs to LED ones, but there isn't enough space for the fans on the back of the bulbs. I've done a search on the forum and noticed that a couple people have successfully installed LEDs, but couldn't find how they got around the space issue. I know you can drill a hole and use the rubber grommet thing for the HID kits, but I'd prefer LED. Why do you want to upgrade to LED? Don't get me wrong - its your bike and you can do what you want with it - but there are some reasons why you shouldn't. The reflector in the headlight assembly is designed to work with light hitting it in all directions from the bulb. As the LED bulbs don't work that way, you cant expect the reflector to work properly and the light that comes out wont cover the same area as an incandescent. HIDs on the other hand are usually designed with a lense in front of them to shape the light output and this is why they can be sketchy in an incandescent reflector housing. A proper LED headlight setup uses a very different reflector mechanism that is designed to work with the directional output of an LED. Most independent tests I've seen (ones that are not done by LED light manufacturers) rate the LED bulbs under the standard incandescent bulb in almost every way except the way the colour looks. If you're wanting to fit LEDs because of the way they look, at the expense of usable light then go for it. Just be careful. If you want more usable light, then consider some spotlights - there are plenty of options out there and mine work extremely well. Thanks for the advice, could you recommend some auxiliary lights? It all comes down to how much money you want to spend - and whether the purpose of the lights is to be seen or improve your night vision. The Denali kit looks OK - I haven seen them in action so I couldn't say, but I think there are other members who have had success using them. At the upper end of the scale, Clearwater make a range of kits to suit the XR and they integrate into the can-bus for control through the wonderwheel... but they are expensive. If you are handy with a soldering iron and wiring, then you can make your own. I've put together my own kit using 2 x 25W LED spotlights, using a Skene IQ-275 controller (John Skene is a member here if you have any questions) and they are absolutely incredible - turn night into day. Where and how did you mount the lights? What is your favorite type of baked good? Never Mounted a Light before, is it like mounting a female ? No. It differs in that it serves a long term purpose. I Thought about the Clearlights but ended up going for the Weisertechnik LEDs. Much more discrete yet very effective and the support was fantastic. 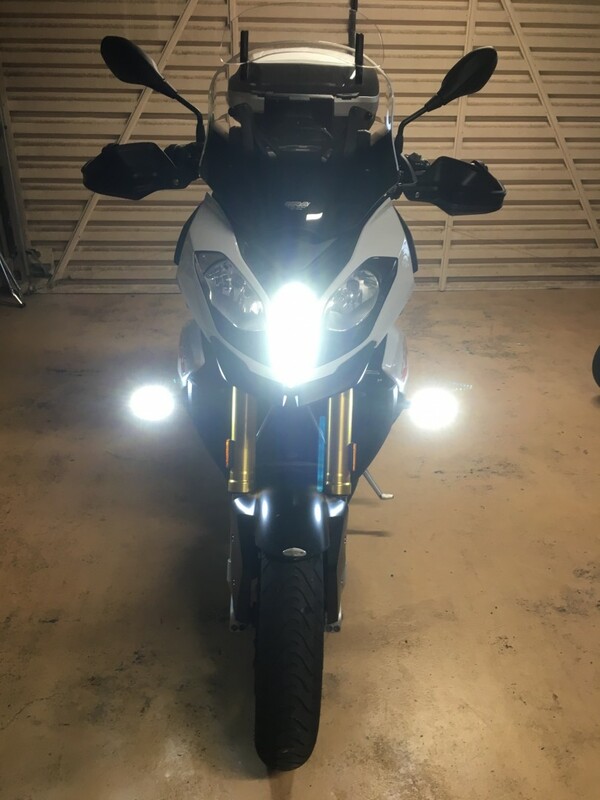 The LEDs integrate with the indicators so no additional light fittings on the side of the bike. Very happy with the end result.